The controversy over the launch of NaMo TV is yet to be resolved with the Ministry of Information and Broadcasting (I&B) having sought time till Friday to respond to the Election Commission's (EC's) queries on the status of the 'channel'. The ministry has argued that since NaMo TV is a direct-to-home (DTH) service, it needs more time to ascertain the facts surrounding its launch on 30 March, after the Model Code of Conduct (MCC) came into force. The I&B ministry's investigations notwithstanding, the problems swirling around the 'channel' are multifaceted and not very easily capable of neat resolutions. To begin with, as matters stand, there is a suggestion that it is not a news channel in the sense we would normally understand the idea and does not, therefore, one presumes, need the kind of licences or clearances that television channels need to operate. Let us provide an illustration of the complexities of the case. On 4 April, the chief executive officer of Tata Sky tweeted a message that effectively absolved NaMo TV of any 'wrongdoing'. "NaMo TV is not a Hindi news service. If someone on the frontline at Tata Sky has tweeted or said that it is a news service, it is a mistake," Harit Nagpal told NDTV. He said NaMo TV "does not fall into any genre" and its feed comes from the BJP via the internet. "Special services do not need a licence," he added. This was put out as a clarification of an earlier tweet from the company, which had said that NaMo TV was a "Hindi news service which provides the latest breaking news on national politics". Therein lies the rub. 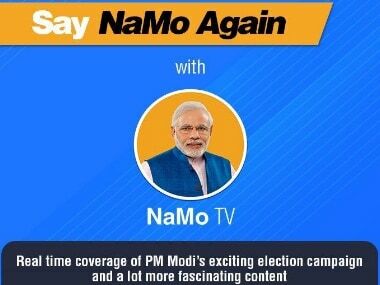 If NaMo TV is an internet-based 'special service' that provides content that any channel or service provider can then telecast in one form or another, how is it to be regulated? This question has a special urgency because the service was set up after the MCC came into force with the exclusive objective of providing content promoting the Bharatiya Janata Party (BJP) and the achievements of its governments, especially the one operating out of Delhi. Some lawyers, who are not BJP apologists, say that prima facie, it is legitimate to set up an entity for election propaganda, even if it has been done after the MCC has become operational. This writer, for instance, can set up a website or blog and disseminate news or views favouring or disfavouring a party or alliance contesting the impending election. Some rules do, however, apply. There is the question of ownership and following from that the issue of responsibility for content. That is an area where the waters get just a little muddied. Normally, lawyers say, the issue of ownership is not particularly germane because a 'special' service, say in the form of a website, does not need to be licensed, nor does it need to be incorporated as a company and, therefore, attract the attention of legal provisions requiring registration, along with all necessary details, with the relevant authorities. But since NaMo TV is a public entity providing a public service, some clarity on ownership and responsibility for content inevitably arise. If an individual disseminates banned content like hate speech on a blog, for instance, he or she can be prosecuted, whether or not the entity in question is registered or not. The same should apply to NaMo TV. The problem is that the ownership of NaMo TV is shrouded in layers of impenetrability. The BJP has not claimed responsibility for the entity. The developer of the application hasn’t been specified but the address in the 'application information section' is the BJP's headquarters in Delhi. At the same time, one of the promoters of the company that first aired NaMo TV has disclaimed any knowledge of what's happening with it now. When asked to whom he had transferred NaMo TV operation, Sujay Mehta told a media outlet, "I am not involved anymore. I do not know anything." The ownership issue gets curiouser and curiouser. One Parag J Shah, who claims to be the owner of the domain name namotv.com has put it up for sale. A message on the website states, "This domain is on sale" and urges those interested in buying it to contact him by email. The domain was registered on 4 October, 2012 and updated on 9 September, 2018. Its registration expires on 4 October, 2025. The domain was, in fact, registered on the same day that the Gujarat BJP unit launched NaMo TV in partnership with five Gujarati channels. But NaMo TV had to be shut down for almost a week when the issue of funding was raised. It was back on air by the third week of October, by which time, the EC decided that NaMo TV's expenses would have to be added to the BJP's party expenditure. The channel, or special internet service, has now resurfaced in time for the impending elections. It airs Prime Minister Narendra Modi’s elections speeches round the clock and propagates his government's policy initiatives. All the major DTH platforms are airing the channel even though it does not have an I&B ministry licence. Its name does not figure in the list of permitted private satellite TV channels on the website of the ministry either. The very fact that the EC has sought clarifications from the I&B ministry points to some problems. Potential grey areas concern, fundamentally, what NaMo TV is in the first place and, therefore, what regulations it is subject to; further what regulations govern the DTH and cable networks that are carrying content from it; and, finally, who owns NaMo TV, and whether disclosure rules apply to it. Some experts say that NaMo TV is an advertising platform for the BJP, which does not require approval, which, in turn, implies that the networks and platforms that are hosting it do not need approval either. It's a moot point whether a teleshopping channel can be equated with a channel dedicated to political propaganda. In any case, even an advertising 'platform' probably needs to specify what kind of an animal it is. A media professional says that the BJP has actually taken advantage of a grey area in the regulations. If that is the case, one of the questions has been answered. But the damaging part of the NaMo TV adventure, if one may call it that, is that the ownership issue remains unresolved. First, the relationship between the domain namotv.com and NaMo TV is eminently unclear. We have now been informed that the domain is up for sale, which further complicates the issue. Second, though ownership of the domain has been claimed, that of the 'channel' has not: Certainly the BJP has not claimed ownership. That raises two questions: First, how can a network or a platform host an entity which does not have a disclosed owner. Tata Sky might clarify that it is a 'special service', but in the public interest, surely, it has some responsibility to issue a clarification about ownership given the seriousness of the controversy, even if it is a private company. Second, if, for example, NaMo TV provides objectionable or illegal content, who will be held responsible and prosecuted? Perhaps the network or platform as co-respondents, but the primary respondent will have to be the owner of the 'channel' or platform. Given these large swathes of grey territory, the EC has to decide whether this exploitation of a 'grey area' sits comfortably with the MCC. Intuitively, the answer seems to be no. It doesn't, which means that the EC has to crack the whip as it had done earlier.